Laser-plasma accelerators (LPAs) got the nickname “tabletop” because, as shown by the unique BELLA accelerator at the U.S. Department of Energy’s Lawrence Berkeley National Laboratory (Berkeley Lab), they can boost electron beams to multibillion electron-volt energies (GeVs) in a few centimeters—a distance thousands of times shorter than conventional accelerators. Past those few centimeters, however, the laser pulse weakens and energy gain stalls. LPAs will have to get off the tabletop if they are to rival proposed conventional colliders, such as 30-kilometer-long electron-positron linear colliders or circular proton colliders 100 kilometers in circumference, with electron-volt energies in the trillions (TeVs), not billions. Only by coupling a hundred LPAs in series, each powered by a BELLA-class laser in series, and accelerating a well-shaped beam from one stage to the next, will such high energies be achieved. In an experiment packed with scientific firsts, Leemans and his BELLA Center colleagues have now demonstrated that a laser pulse can accelerate an electron beam and couple it to a second laser plasma accelerator, where another laser pulse accelerates the beam to higher energy—a fundamental breakthrough in advanced accelerator science. The results are reported in the Feb. 1 issue of Nature. Schematic of the first experiment to achieve staging of laser plasma accelerators (LPAs) with independent laser pulses: a pulse from laser 1 (at left) creates a plasma wakefield in the stage 1 LPA, a gas jet. The resulting electron beam is focused by a capillary-discharge plasma lens and then penetrates a moving tape. Almost simultaneously, an incoming pulse from laser 2 strikes the tape and creates a plasma mirror, which combines the laser beam and electron beam. Entering stage 2, a capillary-discharge LPA, the second laser pulse creates a wakefield in the plasma which further accelerates the electron beam; downstream diagnostics (at right) measure the beam. The solution was to use two different kinds of LPA. The more advanced but more finicky type is a discharge capillary, a block of sapphire with a thin horizontal tube through it. Hydrogen gas fills the tube; a potent electrical discharge ionizes it, separating electrons from their nuclei and forming a plasma. Almost instantly this discharge arc heats the plasma and forms a laser waveguide, a cylindrical channel of thinner plasma in the center; the incoming laser pulse drives through it like a speedboat on water, picking up free electrons in its wake and hurling them forward like a surfer on a following wave. Another kind of LPA is a jet of supersonic gas a few hundred micrometers in diameter. The laser pulse drills through the gas, simultaneously ionizing it to form a plasma and leaving a wake to accelerate the free electrons. The gas jet, conceptually simple but still capable of beam energies of over a hundred million electron-volts, was the team’s choice for stage 1, the beam injector. The more powerful discharge capillary, similar to the kind used in BELLA, would be Stage 2. A critical challenge was how to introduce the second laser pulse, using a mirror, within the few-millimeter space between the two stages. The electron beam would have to pass through a hole in the mirror. The reflected laser pulse would come close behind. Unfortunately, to focus enough power to accelerate the electron beam, the laser focus would have to be so close to the mirror it would blow it to pieces. Video cassette players may be out of fashion, but VHS tape is thin, stretch-resistant, and capable of running for hours at a time. The electron beam pierces the tape virtually untouched. On the opposite side, in the merest fraction of a second before the laser pulse can penetrate the tape, it ionizes the surface to form a dense, perfectly flat plasma: a highly efficient mirror. The staging system was ready for its first test. In the gas-jet LPA, the first laser pulse created an electron beam that passed through the tape, while the plasma mirror reflected the second laser pulse. Electron beam and laser pulse both entered the stage 2 capillary. ATAP scientists had used discharge capillaries to inject and accelerate electrons for over 10 years, but this was the first time anyone had shot an external electron beam into one. They’d never dealt with the full effects of the powerful discharge current: it ionizes the gas and forms an optical waveguide through the plasma, but also creates a strong magnetic field that can blow apart a pre-existing electron beam. Or, more optimistically, can shape and focus it. Van Tilborg called dibs on studying the problem and soon realized the pulsed magnetic field would make an excellent plasma lens. Such a fast-acting lens could find many uses, for example by conditioning beams of existing free-electron lasers. Its immediate application was to tightly focus the staging experiment’s injector beam. The final configuration—gas-jet injector, plasma lens, plasma mirror, discharge capillary second stage, and diagnostics—showed energy gains, for significant portions of the electron beam, of around a hundred million electron-volts. The success of the experiment resulted from on-the-job discoveries plus continuous feedback between experimental observations and computer modeling. Running on a Cray supercomputer at DOE’s National Energy Research Scientific Computing Center (NERSC) at Berkeley Lab, the highly efficient INF&RNO code for modeling laser and plasma interactions could turn a day’s experimental data into a simulation almost overnight, like “dailies” on a movie set. Among many other questions, intricacies of laser timing could be explored; focusing the energetic but ragged beam from the gas jet could be simulated even as the serendipitous discovery of how to actually do it was becoming a reality. 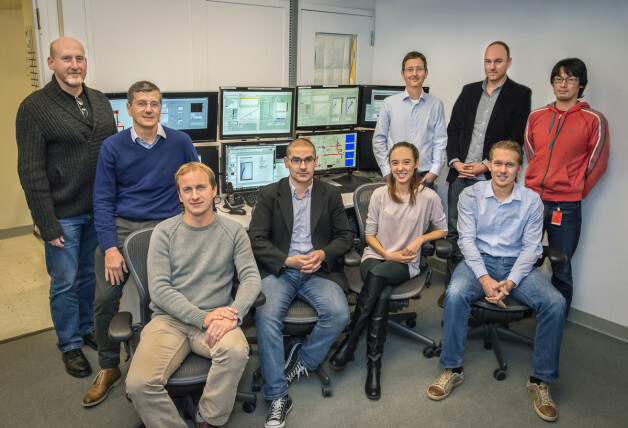 The first successful coupling of two independent laser-plasma accelerators has proven the principle. Next comes the real thing. “Many groups around the world are working on different aspects of LPA development, and I am confident that we will see the first applications of LPAs in the coming decade,” comments James Symons, Associate Laboratory Director for Physical Sciences at Berkeley Lab. “As with all new technologies, the nature of those applications may surprise us.” Challenges remain, but the era of accelerators that are not only compact but can achieve extraordinary energies is upon us. This work was supported by DOE’s Office of Science, the National Science Foundation, and DOE’s National Nuclear Security Administration. The researchers acknowledge the computational resources of the National Energy Research Scientific Computing Center (NERSC), a DOE Office of Science User Facility. “Multistage coupling of independent laser plasma accelerators,” by Sven Steinke, Jeroen van Tilborg, Carlo Benedetti, Cameron G. R. Geddes, Carl B. Schroeder, Joost Daniels, Kelly K. Swanson, Anthony Gonsalves, Kei Nakamura, Nicholas H. Matlis, Brian H. Shaw, Eric Esarey, and Wim P. Leemans, appears in the Feb. 1 issue of the journal Nature. For more about the single-stage BELLA accelerator and its world-record multi-GeV beams go here.